The term a musician’s musician can be met well on different levels. And an artist who takes care of every single beat and note on an album should be put into that term with much respect. 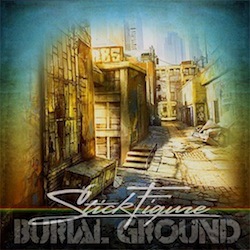 Stick Figure, the often proclaimed one-man group, displays his musicianship in Burial Ground with a message of exploration that can reach several eager listeners. Burial Ground greets listeners with songs that tread a mellow wave on an album that seemingly presents a message of searching. The opening track “Breathe” sets that tone and is the starting flag to a vibe-filled journey. The songs vibe provides a bright beginning to the album. Stick Figure says to “breathe and let it in” to invite listeners with a mind-opening metaphor. Several songs throughout Burial Ground deliver that soul-searching message with great reggae sounds and melodies. The title track, “Burial Ground,” taps into a divine trip that talks about a spiritual cleanse. The album, overall, feels like it was put together from the easy part of soul-searching to the difficult parts with several gems in-between. Songs such as “Golden Hour” create a more peaceful idea of journey with lyrics like “take a look in your heart and you’ll find home.” But it’s songs like “Rocky Road” that present more grit. The idea of the rocky road lets the listener know this album isn’t a soft journey but rather a more realistic path, where the journey for peace is painted as a rough terrain. The album comes to end with a different tone than the beginning. “Coming Home” is a more mellow glow with a great guitar arrangement. The song says, “don’t look back but never forget,” and listeners can take those words to heart with a smooth guitar lick or two. “Dreamland” lives up to its name. The instrumental, an almost polar-opposite nature compared to the opening, is where Stick Figure lets loose and displays his musicianship, executing on all instruments. Throughout Burial Ground, several gems pop out for all sorts of listeners. “Barrels” is the only story-telling track. Even though the song tells a story of a dealer making his way around for a deal, the track doesn’t deviate from the search for home that the album presents. Also, standing out are some great guitar moments. “Just Another Dream” and “Coming Home” are sure to grab the listeners by the hands, but it’s “Weight of Sound” that truly touches the soul. The guitar on the track packs a smooth, warm tone, very reminiscent of some 70s Santana. Reggae connoisseurs will enjoy Half Pint making an appearance on Burial Ground. “Women of the Night” has a care-free feel that grips the listener tightly when Half Pint contributes a great verse in the middle of the track.